Jay Palmer has always been an “edgy” guy. He loves the outdoors and activities such as biking, running, and swimming, and he’s extremely competitive in all he does. The former Iron Man competitor also has a deep entrepreneur’s streak in him. 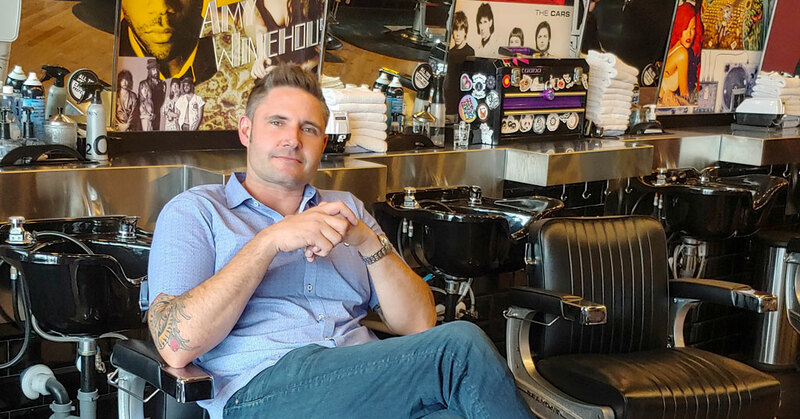 It was because of this background that Palmer discovered – and became a franchisee - with Floyd’s 99 Barbershop, the rapidly growing brand known for its unique, high-energy vibe, great music, and poster plastered walls of iconic musicians. Palmer was familiar with the franchise business model. Prior to joining Floyd’s 99, he spent a half dozen years with Noodles & Company, where he managed locations, implemented training, and helped develop a catering program for the brand. Then in 2007, Palmer was biking in Colorado while training for an Iron Man event. He met another biker who told him about the Floyd’s 99 brand, and after talking, Palmer ended up going along to the brand’s Discovery Day. “I couldn’t believe what I saw, I was blown away,” recalls Palmer. “The founders had developed a fantastic and unique brand that had the edgy kind of feel that I love and a fantastic product to boot.” He became the brand’s second franchisee. Between 2007 and 2009, Palmer opened five locations in his Northern Colorado territory. Clients loved the brand’s unique style and its engaging and friendly employees. And the brand’s integrated support structure from development to opening to training and marketing support made it easy for Palmer to grow his business and add units. “This is a proven concept, there’s no need to reinvent the wheel here,” he says. “The founders have been focused on creating and sustaining a great brand.” The results reflect it. Palmer has seen his same-store sales grow every year that he’s been in the system. Palmer emphasizes that Floyd’s 99 is truly unique. “You could walk into a Great Clips, Sport Clips, or Supercuts and literally not know which one you were in,” he says. But the music, décor, atmosphere, people, and focus on individuality makes Floyd’s 99 stand out from the crowd. Floyd’s 99 also distinguishes itself with its “employee first” culture. These trained and dedicated people are an important part of the equation and the brand’s success. Individuality is embraced and employees feel like part of the family, says Palmer. Palmer is a hands-on operator and believes that’s the best way to grow the business. He’s in and out of stores daily, meets with and communicates regularly with his employees, and engages with clients. If there’s ever a complaint, Palmer handles it himself. “I want to resolve the issue and keep the client,” he says. Today, Palmer operates seven Floyd’s 99 locations in Northern Colorado and plans to open two more stores in 2019 – one in Boulder and the other in Johnstown. All told, his stores give about 26,000 haircuts every month. 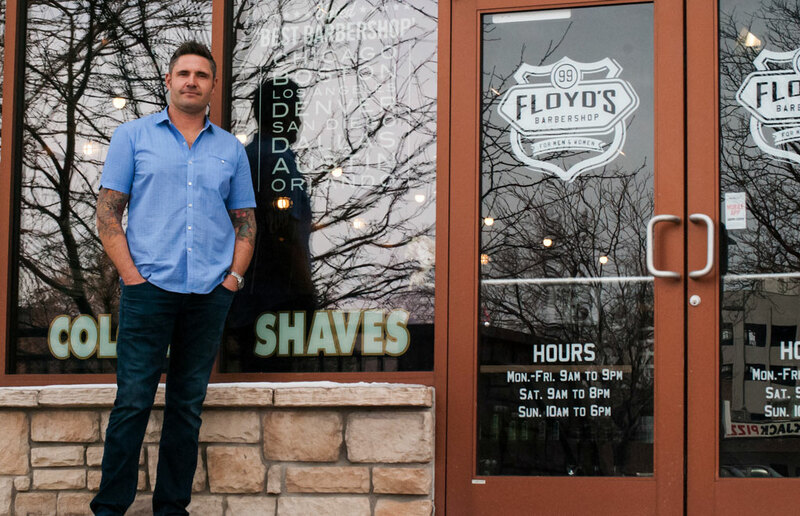 Floyd’s 99 Barbershop offers a full menu of services for men and women, including cuts, color, straight razor shaves, and signature massage shampoo, and every service is finished with a relaxing shoulder massage. Every Floyd’s 99 shop offers a unique high-energy vibe combined with a great value. And at Floyd’s 99, no two shops are the same, making the Floyd’s 99 experience truly one of a kind. For more information about franchising with Floyd’s 99 Barbershop, visit www.floydsbarbershop.com/FRANCHISE/ or contact Scott at scott.n@floydsbarbershop.com.